Alex Caruso scored a career-high 32 points, and the Lakers defeated the Clippers, 122-117, in the coveted "Battle for LA," on Friday night at Staples Center. 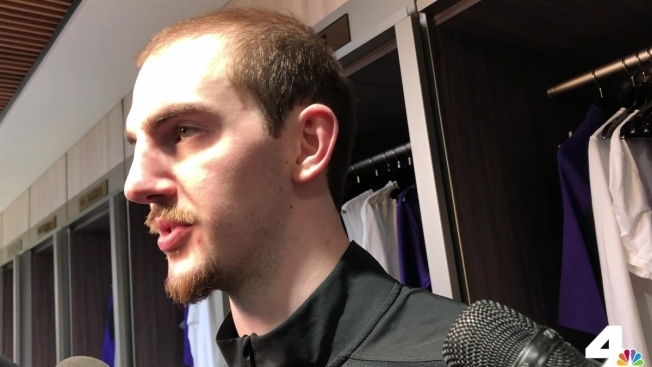 Los Angeles Lakers players Kentavious Caldwell-Pope and Alex Caruso discussing AC's performance and upsetting the playoff-bound Clippers in the "Battle for LA." This is a tale of one city. It was the best of times (Clippers), it was the worst of times (Lakers), it was the age of Jerry West, and it was the age of LeBron James. In their final matchup of the season, the lowly Lakers upset the playoff-bound Clippers, and solidified their role as the best basketball team — albeit briefly — in Tinseltown. "Obviously a game against the Clippers is always exciting because it's the 'Battle for LA'," said Caruso after the game. "It felt good to come out here and split the series two-to-two, instead of give them the season win. The Clippers needed a win to have a shot at a 50-win season, and likely looked past the lowly Lakers, who entered the game battered and bruised with a roster full of G-League players. The Clippers needed win to keep pace with the Utah Jazz for the fifth seed in the Western Conference, but the upset-minded Lakers had other thoughts in mind, as they knocked the Clips down a game, and created turmoil in the seeding at the bototm of the conference. "We assumed we were going to win the game," said Clippers' head coach Doc Rivers. "I'm not worried about being ready for the playoffs. We'll be ready for that. We're not playing well right now." Entering the game, the Clippers were heavy 12-point favorites, but that didn't stop the lottery-bound Lakers from stomping their Staples Center roommates. "Our season didn't turn out how we wanted to, so why not mess with somebody else's," said Lakers' guard Kentavious Caldwell-Pope about upetting the Clippers. Caldwell-Pope had 25 points, including five three-pointers as the Lakers salvaged some dignity, and dealt the Clippers a devastating blow in their hopes of avoiding the Houston Rockets in the first round of the NBA playoffs. "Once we clinched [the playoffs], we took our foot off the gas," said Clippers' guard Lou Williams. "We have a lot of first time playoff guys here. I think myself and Danilo [Gallinari] need to try and do a better job to get the message across to those guys that they have to finish the season as strong as they can." JaVale McGee had a double-double, scoring 18 points and grabbing 10 rebounds. Rajon Rondo also had a double-double with 15 points and 12 assists. "I just try to take care of the ball, get good shots, and make sure we get back in transition defensively," said Rondo of his effort. Entering the contest, the Clippers had won eight of their last 10 games, but now have dropped two straight, and are currently clinging to the sixth spot in the West. They are 2.5 games behind the Jazz (with two to play), and only a half-game ahead of the Thunder and one-game ahead of the Spurs. Should the Clippers struggles continue, it's not inconceivable that they could fall all the way into the eighth spot and face the three-time NBA Champion Golden State Warriors in the first round. Danilo Gallinari led the Clippers with a team-high 27 points, and six different players also scored in double figures for the Clips. "I honestly would rather have the losses happen now than in the playoffs," said Clippers' guard Shai Gilgeous-Alexander who finished with 20 points, eight rebounds, and six assists. The Lakers had won four of their last five before they shut LeBron down for the remainder of the season, but entering the game had lost two in a row, including a lopsided loss to the Warriors a night prior. The Clippers led by 12 points early in the second half, but the Lakers stunned their co-tenants with eight three-pointers in the fourth quarter as Rondo and Caruso sank three each. "I was in a groove and got open shots, I was aggressive," said Caruso of his performance. "I once had a game in the G-League last year where I had a 40-ball [scored 40 points]. There was less people watching though." The Lakers outrebounded the Clippers 55-to-45, and shot a scorching 44 percent from beyond the arc. "We deserved to lose," said Rivers matter of factly. "They played harder. Especially when you play a team that has everyone out, and you let it go down the stretch, then you're just asking for the loss. I really believe we deserved to lose the game tonight. It would've been unfair if we had won the game." The Lakers may have won the battle on Friday, but make no mistake about it, in less than a week's time, the Clippers will be the team to watch in this town, and the Lakers will be away fishing somewhere on an early vacation. LeBron James (groin), Lonzo Ball (left ankle), Josh Hart (knee surgery), Brandon Ingram (shoulder), Reggie Bullock (plantar fasciitis), and Tyson Chandler all missed the game for the Lakers. Patrick Beverly (right hip pointer) and JaMychal Green (birth of a child) both skipped the contest for the Clippers. The Lakers will host the Utah Jazz on Sunday night at Staples Center.